TURN has been a leader in legislative efforts to require California’s regulated utilities purchase more renewable energy. 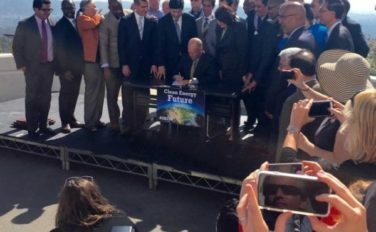 TURN’s support was key to the inclusion of higher renewable energy targets in SB 350 (DeLeon, D-San Diego), the bill addressing climate change recently signed into law by Governor Brown. The Renewables Portfolio Standard (RPS) program now requires that utility companies purchase 50% of the energy they provide to California customers from renewable sources by 2030. In addition, SB 350 directs the Energy Commission to update its building efficiency standards to achieve a doubling of energy efficiency in buildings by 2030. The original RPS bill sponsored by TURN in 2002 has proven to be the most successful clean energy policy in state history. By the end of 2015, more than 12,500 MW of new renewable capacity will be operating to meet the demands of PG&E, SDG&E and SoCal Edison. In the early stages, there was resistance to the move to renewable energy. But the transmission constraints and lack of resources critics complained about didn’t really materialize. Moreover, costs have dropped dramatically in recent years with new renewable energy supplies becoming available at prices on comparable to dirtier sources. Absent the new requirements contained in SB 350, progress on renewable energy would be in danger of stalling, and California’s ability to meet its long-term climate goals would be placed in jeopardy. With the expansion of the successful RPS program, we ensure that there is no pause in California’s continued progress towards a grid powered by sustainable renewable energy resources.